PARK CITY, Utah – Jan. 29, 2019 — Jaybird, a leader in sport headphones for runners, announced today the Jaybird RUN XT True Wireless Sport Headphones, the next evolution of Jaybird RUN designed for runners and athletes. Now totally waterproof (IPX7) with new color options, Jaybird RUN XT combines a streamlined, ultra-comfortable fit with premium sound for reliability in extreme conditions – whether you’re pursuing your limits on a mountain trail or pushing through that last mile on a treadmill. 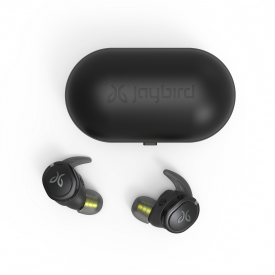 Jaybird RUN XT’s provides 12 hours of playtime, with four hours in the buds and an additional eight hours in the carrying case, providing enough power for all-day outings and extended adventures. A five-minutes quick charge provides a full hour of playtime, so there’s no excuse to not get out there. In conjunction with the launch of RUN XT, Jaybird will also debut in early February a new podcast playlist feature on the app. Podcasts have become one of the most go-to content sources for runners and fitness enthusiasts. With the help of our incredible roster of athletes and brand ambassadors, we’ve curated playlists to help you discover that extra motivation to meet your active goals. We’ll be updating the playlists every two weeks, so you’ll always find something new and interesting to #poweryourpassion. Jaybird RUN XT True Wireless Sport Headphones are available in Black/Flash and Storm Gray/Glacier and are expected to be in stores in February and today from select retailers including jaybirdsport.com, bestbuy.com and amazon.com. The suggested retail price of RUN XT is $179.99. For more information, please visit jaybirdsport.com or connect with us on Facebook and Instagram. The Jaybird app is free and available through the iOS® and Android™ app stores. Established in 2006, Jaybird is a pioneer in sports Bluetooth® wireless headphones for runners, outdoor athletes, and fitness enthusiasts – designed for athletes, built for adventure. Developed in close collaboration with our team of professional athletes, Jaybird earbuds feature secure comfort-fit and incredible, customizable sound in an adventure-proof, compact form factor. Jaybird has established itself as the brand for active people who love to power their passion with their favorite audio content, from music to podcasts, all without wires.